Urban Thirst a leading producer of ready to drink cocktail mixes, has released a new range of cocktail mixes in the best looking bottle in Australia. 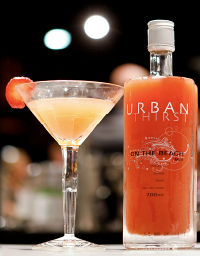 If your looking to impress at your next dinner party or gathering or just appreciate drinking a great cocktail, Urban Thirst delivers with its Classic Cocktail range in a bespoke premium bottle. Created from real fruit juices, all you have to do is mix your favourite spirit and serve to turn any gathering into a special occasion. Not only can the mixes be combined with your favourite spirit to suit your tastes, it is also a hot favourite mocktail. Or you can be part of the party without the spirits and enjoy a classic virgin cocktail just by using soda water. Choose from six delicious cocktail bases, ranging from Margarita to Mojito, Strawberry Daiquiri to French Martini and On the Beach to Cosmopolitan. The best part of all – you can enjoy these delicious premium thirst quenches without breaking the budget. Both ranges are available at Dan Murphy’s, BWS, 1st Choice, Liquorland, Thomas Dux Grocers, Peter’s of Kensington and other leading retailers from $13.99 for the Classic Cocktails and $17.95 for the Frozen Cocktail range. For more information on the range be sure to check out the Urban Thirst website.